ords can not describe how much I loved this book. This series is quite simply amazing and unlike anything I've read before. It's not for the faint heart, but you will be richly rewarded once you enter Nora and Soren's world. Really you will be! Nora is just a breath of fresh air when it comes to heroines. She's smart, savvy, tough and at the same time vulnerable. I love her relationship with all the characters in the book-Kingsley, Soren, Griffen and Wesley. Each one is vastly different and each guy will do anything to protect her. In this book I fell for Soren and Kingsley even more then I did in the last one. Their relationship described in one word is: intense. They have a history together they'd rather not share with the world, but someone has other ideas. In this book, Kingsley and Soren work together to find out who is behind a few incidents that are clearly out to get Soren in trouble. 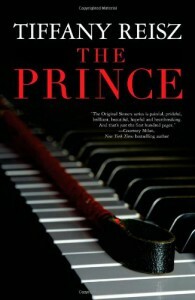 All in all though, The Prince was a wonderful read and once I started reading it I couldn't stop. I honestly can not wait for the next book in this series. This is the book that finally gave me my reading mojo back!!!! !